Effective communication is key for any business looking to either minimize support call loads or maximize potential sales. This unique solution provides you with the tools to do just that. Not only is there a deep telephony integration with SuiteCRM, you also get additional features not found in a conventional telephone system. Features like SMS Conversations, Click to Call, voice recordings attached to your CRM records, and more. It also works great with SuiteCRM. That's right, we've found a way to allow any SuiteCRM install to benefit from these features. If someone calls on the number; this integration checks for an available SuiteCRM user. 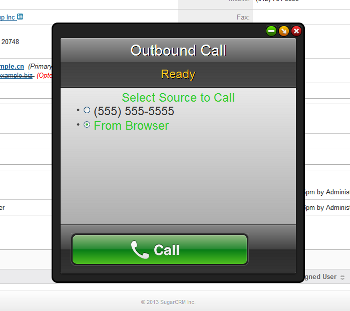 The call is then displayed in a popup to that end user and if the contact exists in SuiteCRM the contact's information is also displayed in the popup. After the call is completed all of the call's information is stored in SuiteCRM along with a recording of the call. On any "Phone" field from any module (custom or default), including Leads, Contacts, and Accounts, click on the phone number to initiate a call. Based on your preference, the call can be made via your computer using the mic and speakers or it can be made by calling your phone number and then the recipient. Once the call is finished the call will be recording, along with a voice recording, in SuiteCRM. Yes, you can also use land lines or mobile phones in addition to your computer. Like any solid call center solution, calls will be distributed based on availability. It's like having your own operator. Configure Incoming Calls so that the caller will be prompted with a set of options according to your customized configuration. Optionally utilize phone number extensions. When an extension is dialed the IVR will handle connecting the call or presenting a "not available" message to the caller depending on if the user is logged in or not. Build your own phone directory. Allow customers to search for the right person to connect with by enabling this option. RT Telephony is not a one trick pony. 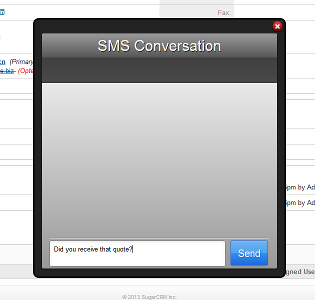 In addition to the verbal communication, it supports textual conversation, SMS Campaigns and predefined SMS templates. SMS conversations can be started with any Contact, Lead, Account as long as there is a Phone number associated with the person. You can send an SMS instantly or schedule it to be trigger at a specific time while saving the communication history. To initiate SMS conversation through SuiteCRM, all you require is RT Telephony integration and the recipient’s number. SuiteCRM is the free, supercharged and open source alternative to SugarCRM. To keep up with the in-demand SuiteCRM market, we have worked on making our plugins compatible with the this CRM. RT Telephony is compatible with all versions of SuiteCRM. What are you waiting for? Save your time and effort and start RT Telephony trial today! Click on the View Pricing button below and get started. We provide instant support for RT Telephony. You can contact us at support@rolustech.com for your queries. Visit our Official website http://www.rolustech.com/ to know more about us. Please create a ticket from the Support tab or drop an email at support@rolustech.com for assistance. Save time for your Sales Representatives and Teammates by linking your subscribed OVH VoIP offers with all SuiteCRM phone fields, allowing them to establish a connection with a contact with just a single click on the phone number! Requires a valid OVH Enterprise VOIP subscription.